This precedent setting sentence will be used in the future. Yep. Bomb threats, swatting people, making up hoaxes to drive up racial tensions, costing police hundreds of hours and tons of resources. Go pick up trash in the highway for a day. Devil's advocate: are we handling this case like normal? Or trying to make an example of him? Would this case have gotten the multitude of police resources to be handled in a matter of weeks if Jussie Smollett was Maurice Campell, Chicago citizen? Would that case have been dropped by the busy dept well before issuing a charge against the erstwhile "victim"? Would it make the news? If there was a charge, would he have been allowed to plead out or have to go through an expensive (to the state) trial? I just want to add, many places here getting caught with a joint will get you mandatory jail even though it's not a felony... And that is a victim-less crime. I'd be curious how many hours were wasted of detectives and police working on this case... In a city nicknamed Chiraq because it has more deaths than our military had in Iraq and Afghanistan. Like other people have stated, this was probably a planned, orchestrated distraction from the Mueller Investigation's outcome. Notice how this action is suddenly the top story being discussed today, with so MANY people outraged? 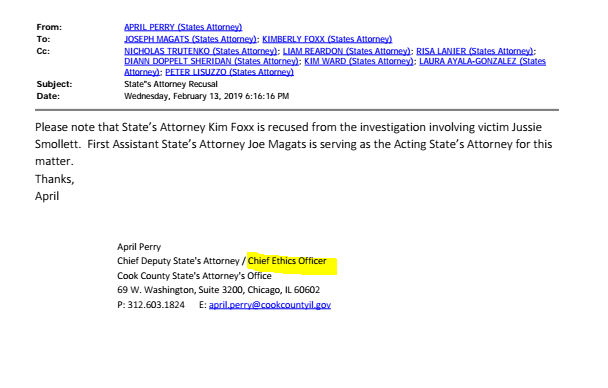 Kamala Harris and Michelle Obama knew Jussie Smollett and Obama's former Chief of Staff, Tina Tchen was the person that reached out to Kim Foxx about the Smollett case. Tina Tchen is deeply connected to the highest echelons of Chicago politics through the Emanuels, as well as the Obamas. Also don't forget that George Soros spent $408k to a Super PAC that supported Chicago prosecutor, Kim Foxx. Sounds like the Democrats playing dirty....yet again. Well, we all better be super mad for a week and then forget about it. America gets f'd in the A once again. A month from now and no one will care. When you have conservatives...even Trump supporters... in complete agreement with Rahm Emanuel, a former Obama Chief of Staff, its pretty obvious that a LOT of people think that the way the prosecutor handled this today is rotten as hell. And it is. Michelle Obama has some explaining to do. At first I thought this was just a spoiled multiple minority person looking to gin up some sympathy and maybe a better paycheck. When he got charged I figured he'd do what wealthy people of all races do, and plea bargain something he could love with and get on with his life. It's not like Hollywood or the political people he's connected to have any morals and would judge him too harshly. But, all charges dropped and sealed for basically $10k. I wasn't aware of the timing of the hoax with the anti-lynching bill or the familial connections to a 2020 Dem contender either. One of the two would be fixers in the DA's office has already been rewarded with a major position in the $PLC. The other just proved once again that Chicago is a cesspool of corruption. I hope their is some federal follow up, but doubt there will be. The corruption in the country has gotten so bad the smell probably rises to the heavens. I do not know why God has largely spared us from judgement, but I fear the day that we as a nation get what we deserve.